I was all set to write to you last night. 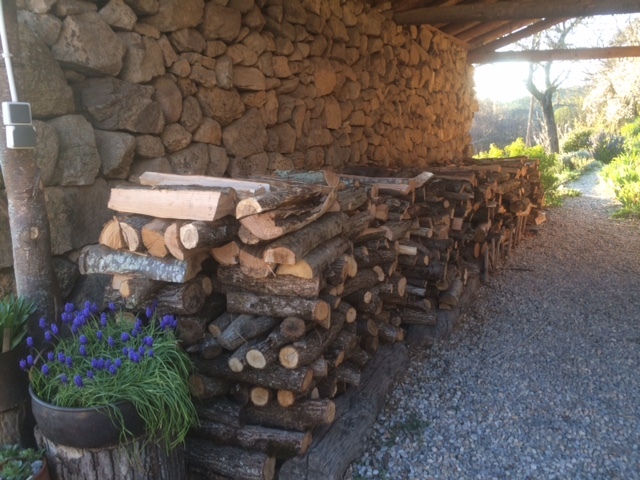 But a late afternoon session of wood stacking (and collecting the wood from the edge of the forest and bringing it into the barn) wiped me out. That or the beer with dinner. I’m going with the wood. And a hard session of power walking early in the morning in the teeth of a mistral gale. I swear I was walking through the forest at a tilt. Not good for a sore back to start with, and compounded by a clenching hour of exercise. But you don’t need an organ recital. 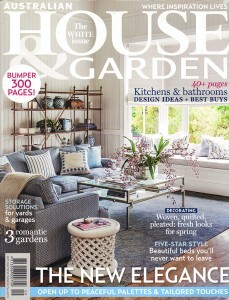 Or news about our lovely wood stack. 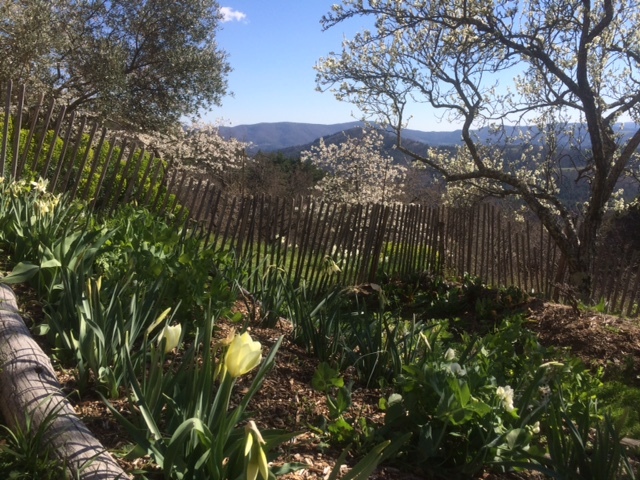 Have another look at that gorgeous spring vista. We have had such a mild and sunny spring so far. And without rain. 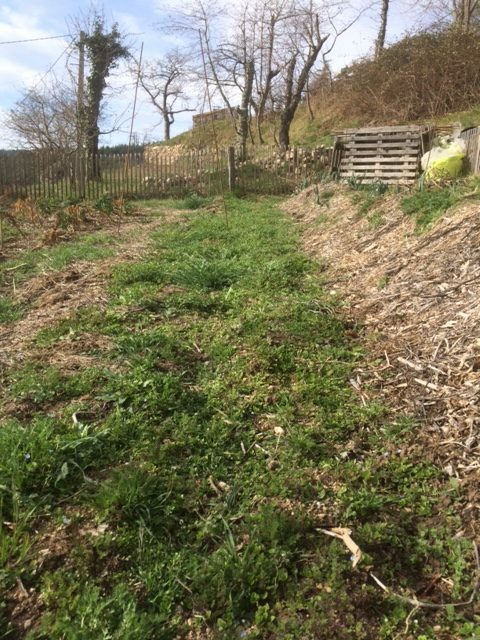 So weeding is just starting to become painful – yanking out unwanted annual plants which have whooshed into growth. You may know that I’m a mulch and a no dig gal. 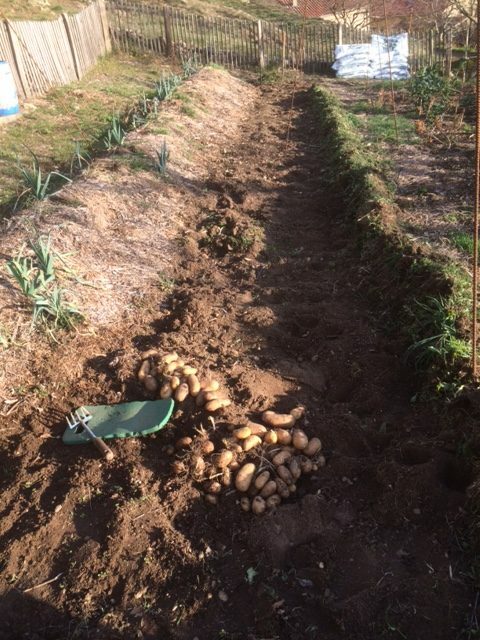 But the one tricky place to practise this for me is the potato row up at the top potager. I tried doing the no dig trick of placing the spuds on the surface and then mulching heavily over the top. And gave the wild animals in our forest a huge carb rush as they found they didn’t even have to do a strenuous digging workout to feast on their food. Badger heaven. And I suspect a bit of hedgehog munching. 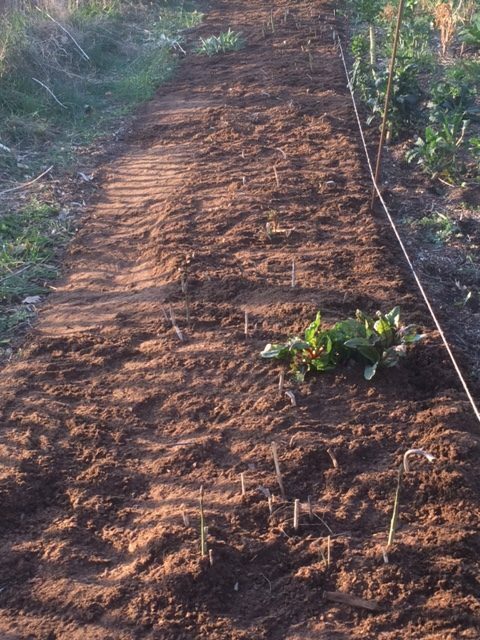 So I fenced the whole area properly and decided to plant them the old fashioned way. And leave them just to the mole rats. 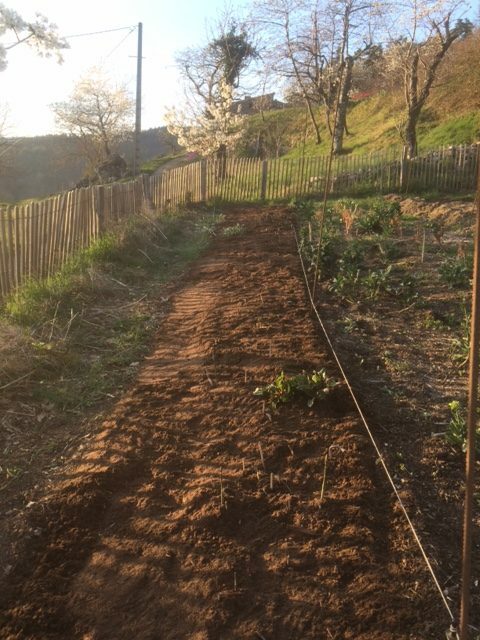 So a fallow bit of this distant vegetable garden needed to be dug. And that’s a shame as it meant getting a fork into that lovely soil and messing things about. 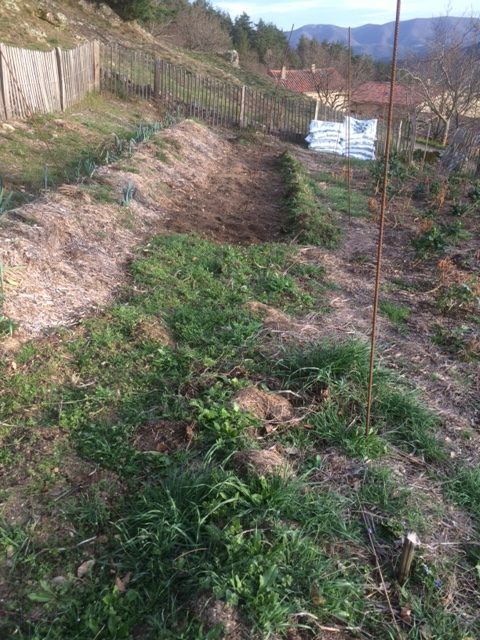 (Note the lovely permaculture bed to the side which is going nicely and will be planted up with tomatoes and kale later in the season. Ideally I would create another permaculture bed some time this year but somehow I can see that slipping way down the list of urgent tasks. My one surprise was finding just how many spuds I forgot to dig up in the plot about two feet to the right of where I wanted to put the new. Excellent. Who knew Charlotte potatoes were keepers? They were actually rather tasty. And we have been feasting since I hauled two heavy buckets down from the plot. A lazy part of me did consider just replanting. But no. Seed potatoes were already chitting in the potting shed and I am already tempting fate with any potential viruses by replanting close to last year’s spuds. 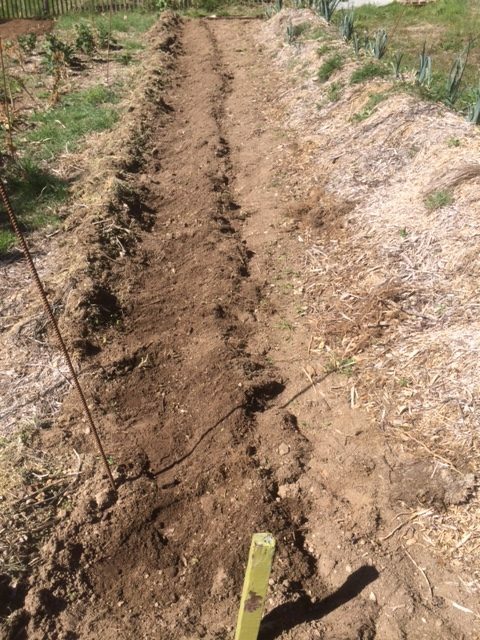 I want to earth up the row when the plants appear. So that means leaving this odd sight of bare earth for a bit. It actually makes me feel a bit twitchy. The eagle eyed of you would have seen some stacks of compost piled up at the end of the row. I’m not going to waste it on the humble spud. I’ll mulch them with grass clippings when the mowing starts. No. Good heavy sacks of compost are going to a good heavy crop of delights. I always get a handful during my birthday week. And then it will be all go until early June.